Ho Chi Minh City is one of the most visited destinations in Vietnam. Because the charm of this modern city looks amazing both at day and at night. Adding the boisterous atmosphere, Ho Chi Minh City night travel is brilliant choice to discover proactive nightlife. Likewise, you can go to lots of places and have many things to do with your friends, families or even yourself. 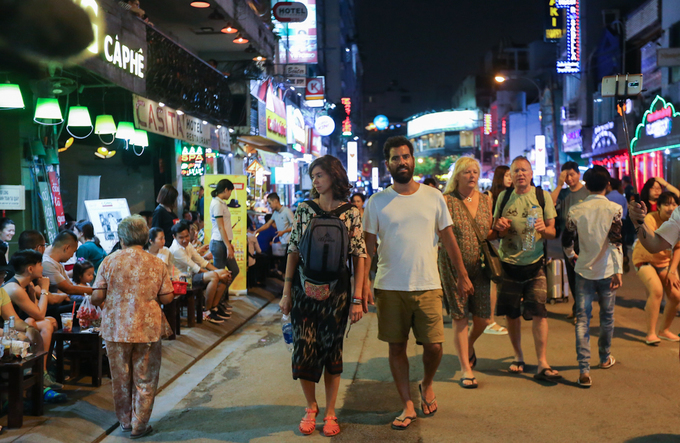 Walking together in Boulevard, sightseeing Sai Gon river or shopping at a traditional market in the central city seems like most incredibly attractive things waiting for you. Now you would rather take a tour of viewing 7 cheerful night activities in Ho Chi Minh City at night. At many locals and foreigners choose this place to begin your Ho Chi Minh City, go out for a walk or listen to wonderful street music here. Also, there are a great number of restaurants, coffee shops, milk tea or banh mi, fast food around Nguyen Hue Boulevard. While breathing cool fresh air, you can enjoy delicious dinner with many kinds of food. + Phuc Long Coffee & Tea Express: 42 Ngo Duc Ke Street, District 1, HCMC. + Street View Coffees: Apartment 42 and 90 Nguyen Hue, District 1, HCMC. Beside Nguyen Hue Boulevard, Bui Vien has also gained much reputation for foreigner night travel in Ho Chi Minh City. 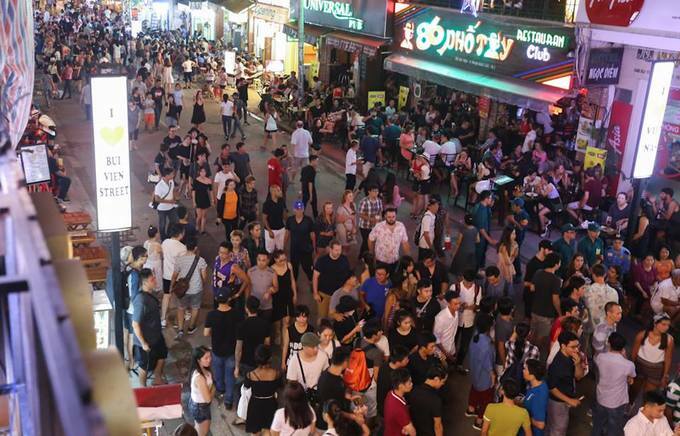 Hence, this street attracts so many foreigners from US, UK, Canada etc… to come and feel the busy and cross-cultural life. This crowded zone almost includes 4 famous roads called Bui Vien, De Tham, Pham Ngu Lao and Do Van Dau. Regardless of skin colors, nationalities or languages, everyone can initiate friendly conversation together. Most noteworthy, some attractive features of Bui Vien are hotels, hostels or travel company , massage services included. 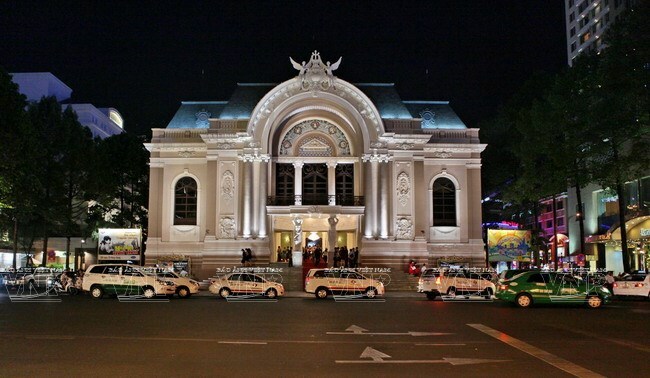 Over 100 years, Ho Chi Minh City Opera House has had majestic and elegant architectural design of following Gothique style. Also, at night, shiny lights make the Opera House become more sparkling and fanciful than ever. Here, travelers can drink some coffee and see ancient architecture under the beautiful sky. In some special dates, there are lots of incredible things to do there: joining big events, experiencing shows and workshops like Lunar New Year Music Show or À Ố Show. Furthermore, the ticket of performances varies from 80 to 800 thousand dong, which is rather suitable for all ranges from students to high society. Sometimes you want to feel peaceful city and rescue from busy life. 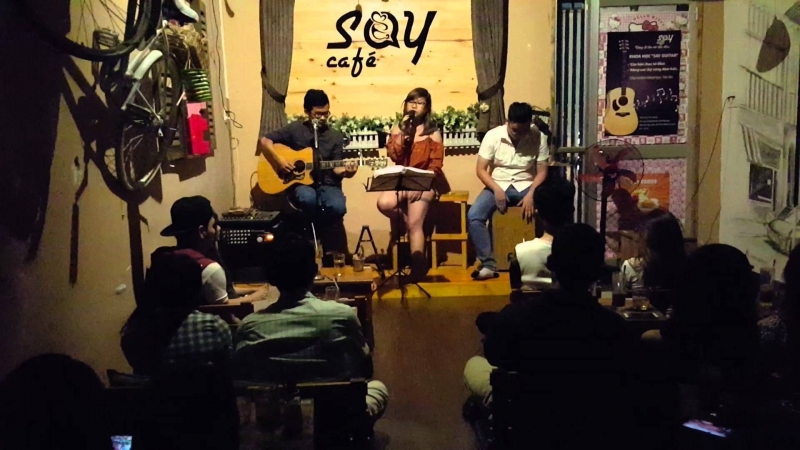 Hence, this is an ideal time to go to coffee shops and feel the beat with live acoustic performances. Also, this is one interesting thing to do in Ho Chi Minh City at night. One incredible thing to do in Ho Chi Minh City at night is to visit Snowtown Saigon and feel like being in a Western country in the winter. Probably, It is a wonderful choice to experience actual winter in Ho Chi Minh City that you never ever have before. In conclusion, Snowtown Saigon really makes you excited about lots of snow house, shiny lights beside windows, and beautiful landscape here. 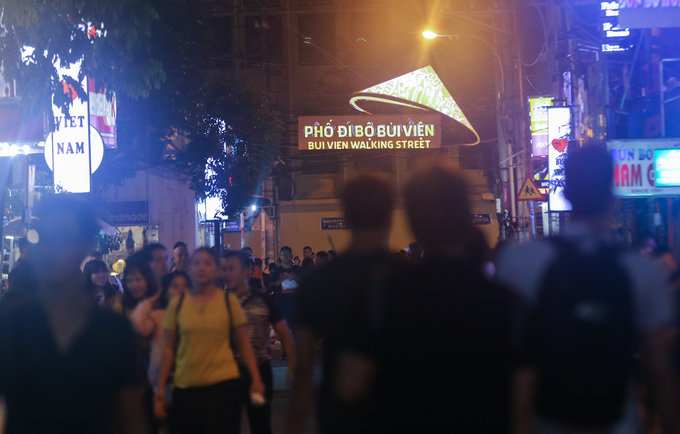 Ho Chi Minh City at night never omits jubilant hangouts with friends in bar and beer club. Another, choosing a fabulous view and drinking some beer or wine and going dancing to DJs remixes makes your day. Hence, let’s go crazy and forget all sorrows after a long day. Take a look at some hot bars and beer clubs in Ho Chi Minh City. Chill Sky Bar is a must-have-go bar of any visitors when traveling to Ho Chi Minh City. On the rooftop, you can easily take the heart-breaking view of the city at night. Moreover, you can drink, eat, talk and listen to beautiful songs. Open time: 17h30 – 2h00. Price: 200 – 500 thousand dong. Covered by cube design language, Cloud 9 Rooftop Bar gives out luxurious and modern design with perfect location. Visit Barocco Bar, drink little red wine and enjoy chilled out music here. Price: 500 – 800 thousand dong. + Mob Beer Club – 152 Nam Ky Khoi Nghia Street, District 1. It is not surprising that when you go to a modern city like HCMC, you have to hit the town and drink some beer. Moreover, along with big bar lounge, Mob Beer club delivers amazing DJs with great remixes tailed for your dance moves. Above all, this club is also the paradise of various beer imported around the world. Price: 150K – 550K dong. Bitexco Tower design is inspired by lotus, which is the national flower of Vietnam. And, this 262m tower represents the modernity and integration of HCMC in world trade. Notably, the skyscraper – the well-known symbol of Ho Chi Minh City has stunning Saigon panoramic view for visitors. Let’s the whole splendid and magnificent beauty of HCMC from Skydeck, which is located on the 49th floor of Bitexco Tower. In addition, the binocular system helps to see different nightlife angles from ancient to modern places in glorious Saigon from the 178m height. In conclusion, this is a valuable chance for you to see a whole lively and magical picture of Ho Chi Minh at night. Ben Thanh Market is the ancient and historical attraction that you have to visit in Ho Chi Minh City at night. When the night falls, the light from this reputable marketing almost shines big corner around. As a result, foreigners who travel in Vietnam pick Ben Thanh as the top must-go place to understand more about cultural Saigon. Another, the market trader sells many traditional dishes such as Vietnamese rice, banh mi, hu tieu, banh xeo… Furthermore, souvenirs and costume are also available for sale. 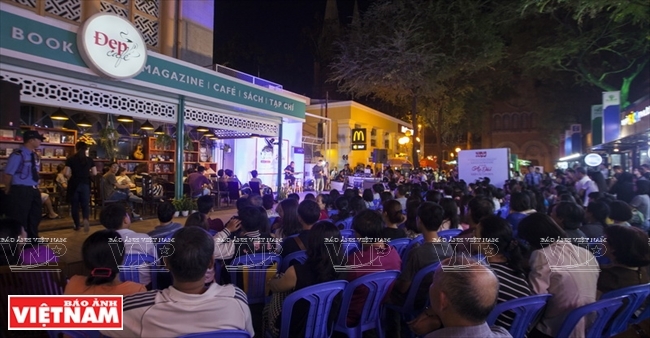 The first book street in Ho Chi Minh City is on Nguyen Van Binh, District 1. This may be a nice attraction for almost all book lovers, who enjoy various kinds of books in Vietnam and foreign countries. The book street is open from 7h00 to 22h00, so you can take time to walk at night, drink a cup of coffee and read favorite books at nighttime. Also, there are a lot of foreign book stands, which certainly makes comfortable for foreigners to pick. In addition, Nguyen Van Binh Book Street has many beautiful corners for you to take a selfie/ photo to share with people on social media. 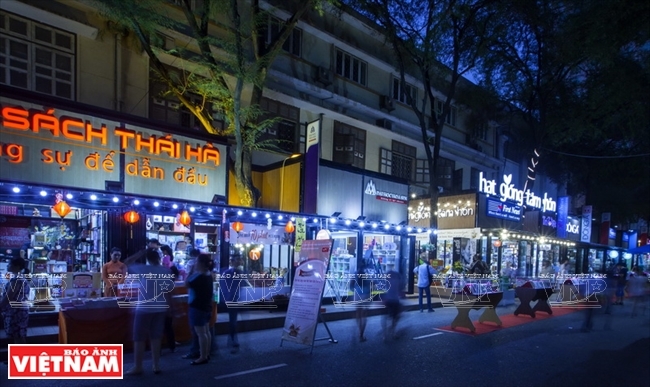 And, in festive time, the book street is decorated with many seasonal styles like Christmas with pines and gifts… or Lunar New Year Eve with apricot blossom and red envelopes… Therefore, remember to select these special time to share memorable moments in Ho Chi Minh city with your close people. It’s time to customize your amazing night tour that has many amazing things to do in Ho Chi Minh City! These are 7 must-have-go picks for fantastic Ho Chi Minh City at night for any visitors. So, let’s discover our life, our culture through a lot of promising destinations by booking our Ho Chi Minh City night tour. Another, do you need a customized private tour? Give your free time, desired places and mix your own favorite tour. In addition, our private tour can be scheduled at any time when suits your personal life. Go traveling and have fun! Then, we will be your ideal trip advisor for memorable travel ever in Vietnam. Book or Customize your own night tour right now with Asiawaytravel!